Two street musicians fight, perhaps over a place to play their instruments. The man on the left, wearing a hurdy-gurdy slung around his shoulders, defends himself with a knife and the crank of his instrument. The man in the center hits him with a shawm, a precursor to the oboe, and squeezes a lemon into his eyes to determine the legitimacy of the old man's blindness. To the right, two more itinerant musicians laugh and grin, enjoying the fight. An anguished old woman grasps the top of her broom and watches from the left. She wears a pleading expression, as if begging them to stop their quarreling. The figures are compressed in a shallow space, pushed up close to the viewer to create a sense of claustrophobia and add to the immediacy of the scene. Georges de La Tour describes each character and his or her expression in great detail: rotting teeth, leathery skin, and wild, unfocused eyes. Different textures--fabrics, wood, hair, and flesh--are minutely observed and realistically painted. Charles Edward Hill-Trevor, third baron Trevor, 1863 - 1950 (Brynkinalt, Denbighshire, Wales), by inheritance to Charles Edwin Hill-Trevor, 1950. Sterling, Charles. "Two New Paintings by Georges de La Tour." The Burlington Magazine 72, no. 422 (May 1938), p. 207, n. 6. Jamot, Paul. "Georges de La Tour: A propos de quelques tableaux nouvellement découverts II." Gazette des Beaux-Arts, 6th series, vol. 21 (February-June 1939), p. 281. Pariset, F.G. Georges de La Tour (Paris: Henri Laurens, 1948), p. 300. Pariset, F.G. "La Servante à la puce." Le Pays Lorrain, no. 30 (1958), p. 106. Pariset, F.G. "Y a-t-il affinité entre l'art espagnol et Georges de La Tour?" In Velazquez, son temps, son influence: Actes du colloque tenu à la Casa de Velazquez, 7, 9, 10 décembre, 1960 (Paris: Arts et métiers graphiques, 1963), p. 57. Sterling, Charles. "La Peinture Française et la Peinture Espagnole au XVII siècle." In Velazquez, son temps, son influence: Actes du colloque tenu à la Casa de Velazquez, 7, 9 , 10 décembre, 1960 (Paris: Arts et métiers graphiques, 1963), p. 115. Pariset, F.G. "Acquisitions récentes du Musée Lorrain (Un Vielleur)." Le Pays Lorrain (1962), pp. 145, 148. Bougier, A.-M. Georges de La Tour, Peintre du Roy (Bruges: Desclée de Brouwer, 1963), pp. 59-60. Chatelet, Albert, and Jacques Thuillier. French Paintings from Fouquet to Poussin. Stuart Gilbert, trans. (Geneva: Skira, 1963), p. 186. Tanaka, Hidemichi. "L'Oeuvre de Georges de la Tour." Ph.D. diss. (Université de Strasbourg, 1969), pp. 62-66, 124, 154-55 n89-93, 164, pl. 3-1. Nicolson, Benedict, and Christopher Wright. "A New Painting by Georges de La Tour." The Burlington Magazine 113, no. 824 (November 1971), pp. 669-70, figs. 1, 37. Christie, Manson & Woods, London. Important Pictures by Old Masters. December 8, 1972, pp. 88-91, lot 99, ill.
Rosenberg, Pierre, and Jacques Thuillier. Georges de La Tour, exh. cat. (Paris: Réunion des musées nationaux, 1972), pp. 134-37, no. 8, ill.
"Coming Auctions." Art News 71, no. 8 (December 1972), pp. 51-52, ill.
Blunt, Anthony. "Georges de La Tour at the Orangerie." The Burlington Magazine 114, no. 833 (August 1972), pp. 516, 519, 523. Cavina, Anna Ottani. "La Tour all'Orangerie." Paragone, vol. 23. (November 1972), p. 17, no. 11. Nicolson, Benedict, and Christopher Wright. "Georges de La Tour et la Grande Bretagne." La Revue du Louvre et des Musées de France, no. 2 (1972), pp. 137-38. Tanaka, Hidemichi. L'oeuvre de Georges de La Tour (n.p., 1972), pp. 33-35, pl. 4-1. Thuillier, Jacques. L'Opera Completa di Georges de La Tour (Milan: Rizzoli, 1973), p. 89, no. 22. Grossman, Fritz. "Some Observations on Georges de La Tour and the Netherlandish Tradition." The Burlington Magazine 115, no. 846 (September 1973), p. 580. Rosenberg, Pierre, and François Macé de l'Epinay. Georges de La Tour: Vie et oeuvre (Fribourg: Office du livre, 1973), pp. 22-24, 34, 42, 110-11, no. 21, ill.
Solesmes, François. Georges de La Tour (Lausanne: Editions Clairefontaine, 1973), pp. 53-56, 154-55, ill.
Rosenberg, Pierre, and François Macé de l'Epinay. Georges de La Tour: Leben und Werk. Ursula Vogel-Roeder, trans. (Berlin: Mann Verlag, 1974), pp. 30, 32, 34, 104-5, no. 21, ill.
Nicolson, Benedict, and Christopher Wright. Georges de La Tour (London: Phaidon, 1974), pp. 9, 12, 17-18, 21, 26-29, 31-32, 35, 45, 55, 192-93, no. 56, figs. 36-37. Bordeaux, Jean-Luc. "The J. Paul Getty Museum: La peinture française." Connaissance des arts, no. 278 (April 1975), pp. 81-83, fig. 3. Fredericksen, Burton B., ed. The J. Paul Getty Museum: Greek and Roman Antiquities, Western European Paintings, French Decorative Arts of the Eighteenth Century (Malibu: J. Paul Getty Museum, 1975), pp. 71, 124, ill. Masterpieces of World Art from American Museums, from Ancient Egyptian to Contemporary Art, exh. cat. (Tokyo: National Museum of Western Art, 1976), p. 17, no. 29, ill.
Fredericksen, Burton B., et al. Guidebook: The J. Paul Getty Museum. 3rd ed. (Malibu: J. Paul Getty Museum, 1976), pp. 59, 68, ill.
Schleier, Erich. "Georges de La Tour (1593-1652): Essendes Bauernpaar; Zu einer Neuerwerbung der Gemäldegalerie." Jahrbuch Preussischer Kulturbesitz 13 (1976), pp. 238-40, fig. 85. Spear, Richard E. "A New Book on La Tour." The Burlington Magazine 118, no. 877 (April 1976), p. 234. Fredericksen, Burton B., Jiří Frel, and Gillian Wilson. Guidebook: The J. Paul Getty Museum. 4th ed. Sandra Morgan, ed. (Malibu: J. Paul Getty Museum, 1978), pp. 87-88, ill.
Leppert, Richard D. Arcadia at Versailles: Noble Amateur Musicians and Their Musettes and Hurdy-gurdies at the French Court (c. 1660-1789) (Amsterdam: Swets and Zeitlinger, 1978), p. 32. Nicolson, Benedict. The International Caravaggesque Movement: Lists of Pictures by Caravaggio and His Followers throughout Europe from 1590 to 1650 (Oxford: Phaidon, 1979), p. 65. Smith, Martha Kellogg. "Georges de La Tour's 'Old Man' and 'Old Woman' in San Francisco." The Burlington Magazine 121, no. 914 (May 1979), p. 294. Wright, Christopher, and Diana de Marly. "Fake?" Connoisseur 205, no. 823 (September 1980), p. 23. Fredericksen, Burton B. Masterpieces of Painting in the J. Paul Getty Museum (Malibu: J. Paul Getty Museum, 1980), unpaginated, no. 41, ill.
Fredericksen, Burton B., Jiří Frel, and Gillian Wilson. The J. Paul Getty Museum Guidebook. 5th ed. (Malibu: J. Paul Getty Museum, 1980), p. 81-82, ill.
Katzander, Howard L. "Thoughts on the Art Market: Merde? On the Walls of the Metropolitan?" International Art Market 20, no. 12. (December 1980), p. 323. Hellerstedt, Kahren Jones. "Traditional Motif in Rembrandt's Etchings: The Hurdy-Gurdy Player." Oud-Holland 95, no. 1 (1981), pp. 26, 29, n. 29. Rosenberg, Pierre, and John Pope-Hennessy. La peinture française dans les collections américaines, exh. cat. (Paris: Galeries nationales du Grand Palais, 1982), pp. 74-77, 255, 354, no. 37, ill.
Cuzin, Jean-Pierre. "French 17th-Century Paintings from American Collections." The Burlington Magazine 124, no. 953 (August 1982), p. 529. "La peinture français du XVIIe siècle dans les collections américaines." Le Petit Journal des Grandes Expositions 116 (1982), p. 2, ill.
Rosenberg, Pierre, ed. France in the Golden Age: Seventeenth-Century French Paintings in American Collections, exh. cat. (New York: Metropolitan Museum of Art, 1982), pp. 74-75, 77, 255, no. 37, ill.
Wilson, William. The Los Angeles Times Book of California Museums (New York: Harry N. Abrams, 1984), pp. 173, 175, ill.
Wright, Christopher. The Art of the Forger (New York: Dodd, Mead, 1984), pp. 44, 126. Ribault, Jean-Yves. "Réalisme plastique et réalité sociale: A propos des aveugles musiciens de Georges de La Tour." Gazette des Beaux-Arts, 6th series, 104 (July-August 1984), pp. 1-4. Rosenberg, Pierre, et al. "France in the Golden Age: A Postscript." The Metropolitan Museum of Art Journal 17 (1982), p. 29. Wright, Christopher. The French Painters of the Seventeenth Century (London: Orbis, 1985), pp. 203, 283. Bajou, Thierry. De La Tour (Paris: Hazan, 1985), pp. 5, 41, 44-45; pp. 28-29, ill.
Rosenberg, Pierre, and Marion C. Stewart. French Paintings, 1500-1825: The Fine Arts Museums of San Francisco (San Francisco: The Fine Arts Museums of San Francisco, 1987), pp. 60, 61-64. Fredericksen, Burton B. Masterpieces of Painting in the J. Paul Getty Museum. Rev. ed. (Malibu: J. Paul Getty Museum, 1988), unpaginated, no. 31, ill.
Fohr, Robert. "La Tour (Georges de)." In Encyclopaedia universalis (Paris: Encyclopaedia universalis France, 1990), pp. 532-34, ill.
Koch-Hillebrecht, Manfred. Museen in den USA: Gemälde (Munich: Hirmer Verlag, 1992), p. 277. Thuillier, Jacques. Georges de La Tour (Paris: Flammarion, 1992), pp. 64-72, ill.
Thuillier, Jacques, et al. L'Art Lorraine au temps de Jacques Callot, exh. cat. (Nancy: Musée des Beaux Arts, 1992), pp. 284-85, 286, no. 92, ill., entry by Pierre Rosenberg. Beresford, Richard. "L'Art en Lorraine au temps de Jacques Callot. Nancy, Musée des Beaux-Arts." The Burlington Magazine 134, no. 1076 (November 1992), p. 745. Sylvestre, Michel. "Création et mécénat. La vie quotidienne des artistes lorrains au 17e siècle." Dossier de l'art, no. 8 (June-July 1992), p. 9, ill.
Amalric, Pierre. "Rencontre avec Georges de La Tour." Peristyles, no. 2 (1993), pp. 15-18, ill.
Rioux, Jean-Paul. "Oeuvre originale, copie ancienne: La Rixe des musiciens." In Georges de La Tour ou les chefs-d'oeuvre révélés, exh. cat. (Metz: Editions Serpenoises, 1993), pp. 48-52, pl. 2. Luna, Juan J. Los músicos de Georges de La tour (1593-1652): Alegoriá y realidad en la pintura barroca francesca, exh. cat (Madrid: Museo del Prado, 1994), pp. 31, 42, 73-75, no. 2, ill. Le Floch, Jean-Claude. Le Signe de contradiction (Rennes: Presses universitaires de Rennes 2, 1995), pp. 17-18, 46, 57, 61, 66, 68, 119, 121, 127, ill. Le Floch, Jean-Claude. La Tour: Le Clair et L'Obscur. (Paris: Herscher, 1995), pp. 9-10, 13. Fredericksen, Burton B., et al. Masterpieces of Painting in the J. Paul Getty Museum. 3rd ed. (Malibu: J. Paul Getty Museum, 1995), unpaginated, no. 31, ill., entry by Burton B. Fredericksen. Conisbee, Philip, et al. Georges de la Tour and His World, exh. cat. (Washington, D.C.: National Gallery of Art, 1996), pp. 8, 37, 52-58, 184, 186, 188, 193, 198, 202, 238-39, 243-45, 253-54, 264, 291, 295, no. 9, ill.
Brême, Dominique. Georges de la Tour (Paris: Somogy, 1997), pp. 46-53, ill.
Fohr, Robert. Georges de la Tour: Le Maître des nuits (Paris: A. Biro, 1997), pp. 9, 10, 13, ill.
Cuzin, Jean-Pierre, and Dimitri Salmon. Georges de la Tour: Histoire d'une redécouverte (Paris: Réunion des musées nationaux, 1997), p. 41. Fredericksen, Burton B., et al. Masterpieces of the J. Paul Getty Museum: Paintings (Los Angeles: J. Paul Getty Museum, 1997), pp. 74-75, no. 40, ill., entry by Burton B. Fredericksen. Walsh, John, and Deborah Gribbon. The J. Paul Getty Museum and Its Collections: A Museum for the New Century (Los Angeles: J. Paul Getty Museum, 1997), p. 124, ill.
Rosenberg, Pierre, and Bruno Ferté.La Tour (Milan: Electa, 1998), pp. 18, 19, 36-39, ill.
Lyons, Lisa, ed. Departures: 11 Artists at the Getty, exh. cat. (Los Angeles: J. Paul Getty Museum, 2000), pp. 44-45, ill.
Ferino-Pagden, Sylvia, and Luiz Marques. Dipingere la musica: Strumenti in posa nell'arte del cinque e seicento (Milan: Skira, 2000), pp. 250-53, no. V.18, ill., entry by Wolfgang Prohaska. The J. Paul Getty Museum Handbook of the Collections. 6th ed. (Los Angeles: J. Paul Getty Museum, 2001), p. 126, ill. Spear, Richard E. "Caravage et La Tour: ténèbres et lumière de la grâce." In L'Âge d'or du nocturne. Paulette Choné, ed. (Paris: Gallimard, 2001), pp. 92-96, ill.
Marandet, François. "The Apprenticeship of Maurice-Quentin de La Tour (1708-1788)." The Burlington Magazine 144, no. 1193 (August 2002), pp. 503, 505, ill.
Hagen, Rose-Marie and Rainer. What Great Paintings Say. 2 vols. (Cologne: Taschen, 2003), vol. 2, pp. 214-19. Allen, Denise, et al. Masterpieces of Painting in the J. Paul Getty Museum. Rev. ed. (Los Angeles: J. Paul Getty Museum, with Thames & Hudson, 2003), pp. 70-71, no. 37, ill., entry by Burton B. Fredericksen. Takahashi, Akiya, Kumi Otani, et al. Georges de La Tour, exh. cat. (Tokyo: National Museum of Western Art, 2004), pp. 48, 220, ill.
Olson, Todd P. " 'Long Live the Knife': Andrea Sacchi's 'Portrait of Marcantonio Pasqualini'." Art History 27, no. 5 (November 2004), p. 712, ill.
Rosenberg, Pierre. "Deux notes concernant Georges de la Tour." In Studi sul Barocco romano: Scritti in onore di Maurizio Fagiolo dell'Arco (Milan: Skira, 2004), pp. 138-40. Cuzin, Jean-Pierre. "Deux nouveaux documents sur La Tour." La Revue du Louvre et des musées de France 55, no. 1 (February 2005), p. 62. The J. Paul Getty Museum Handbook of the Collections. 7th ed. (Los Angeles: J. Paul Getty Museum, 2007), p. 118, ill.
Lévy, Jean-Marc. Médecins et malades dans la peinture européenne du XVIIe siècle. 2 vols. (Paris: L'Harmattan, 2007), vol. 1, vol. 1, pp. 133-34. Lévy, Jean-Marc. Médecins et malades dans la peinture européenne du XVIIe siècle. 2 vols. (Paris: L'Harmattan, 2007), vol. 2, pp. 108-9, fig. 57. Molina, Antonio Muñoz. "Hermosura y luz no usada: un tocador de zanfona de Georges de La Tour." In Los Pintores de lo Real (Barcelona: Galaxia Gutenberg, 2008), pp. 250-51, pl. XXI. Arasse, Daniel. Le Détail: Pour une histoire rapprochée de la peinture (Paris: Flammarion, 2008), pp. 214-15, ill.
Cuzin, Jean-Pierre. Figures de la réalité: Caravagesques français, Georges de La Tour, les frères Le Nain [...] (Paris: Institut National d'Histoire de l'Art, with Hazan, 2010), pp. 163-64, 175, 179, 185, 190, 199, 201, 205, 235, 237, 245, 257, 270, 271, 279, ill.
Marandel, J. Patrice, ed. Caravaggio and His Legacy, exh. cat. (Los Angeles: Los Angeles County Museum of Art, with DelMonico Books/Prestel, 2012), pp. 150-51, 166, no. 55, ill., entry by J. Patrice Marandel. De la Cobos, Andrés Úbeda. "Georges de La Tour and the Painters of the Spanish School." In Georges de La Tour, 1593-1652, exh. cat. Dimitri Salmon and Andrés Úbeda de la Cobos, eds. (Madrid: Museo Nacional del Prado, 2016), p. 72. Salmon, Dimitri and Andrés Úbeda de la Cobos, eds. Georges de La Tour, 1593-1652, exh. cat. (Madrid: Museo Nacional del Prado, 2016), pp. 96-99, no. 5, ill., entry by Richard Rand. Students explore a narrative depicted in a work of art and write a newspaper article about the event, using visual clues. 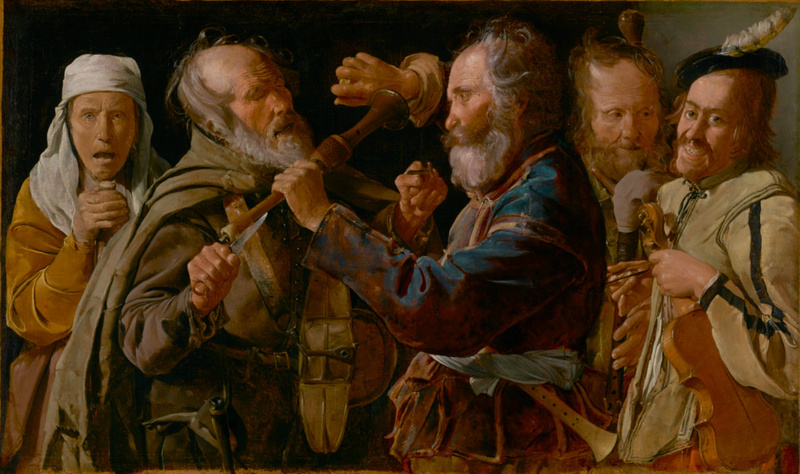 Lesson in which students discuss a 17th-century painting depicting musicians in a fight. They write a description in present and future tense.